Elizabeth II – Queen of the United Kingdom, Canada, Australia, and New Zealand – ascended to the throne in February 1952. At about that time, Kathryn “Kate” Bugglen – a Baltimore wife and mother – was overseeing her own domain, as a front desk clerk and reservations manager for the Lord Baltimore Hotel. Elizabeth’s title and crown were bestowed upon her by right of royal succession. Kate Bugglen would also receive a crown in the 1950’s. 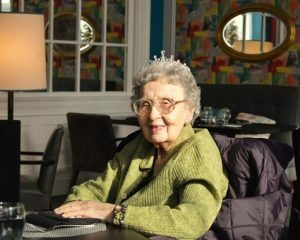 Now 92, Kate Bugglen recently returned to the Lord Baltimore Hotel, at the behest of the venue’s management, for a luncheon which honored her a second time as “Queen for the Day.” It was Kate’s first trip to the Lord Baltimore Hotel since the historic locale’s top-to-bottom renovation. “When my daughter Leslie told me we were coming here, I said, ‘Oh, do I have to go down there again?’ But when I look back, my memories of working here are all very good. You know that movie, Great Expectations? Well, I have great expectations about being here again. The employees have been so gracious and I cannot tell you how happy I am,” said Kate. The plan to honor Kate began when daughter Leslie reached out to the hotel and asked if they could send her feisty mother a Christmas card. The hotel happily obliged, then went one better by setting up the luncheon and a private tour of the opulent premises. Kate Bugglen (r) with an unknown coworker at the front desk of the Lord Baltimore Hotel circa August 1956. Kate told us she worked at the Lord Baltimore for about twelve years. Her boss was Howard S. Busick, who, along with brothers Nelson and Morton, managed the magnificent hotel their father Harry had built in 1928. “It’s hard to explain how gracious they were to their employees. I started at the front desk, but when they needed someone to assist in the reservations department, they moved me back there. When the manager of that department announced he would be leaving, they made me the manager. I held that position for five years. If we over-booked, they simply took care of it. I was the one who would have been responsible, but they never harshly reprimanded me. Kate’s time at the Lord Baltimore coincided with the return of Major League Baseball to Baltimore and the arrival of the NFL. 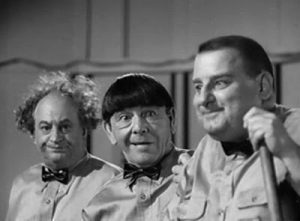 In her twin capacities as desk clerk and reservations manager, she met numerous athletes and celebrities, but the guests who still stand out were The Three Stooges. Kate could not recall which incarnation of the Stooges graced Baltimore during her time at the hotel. But Michelle Squiccimara, Registrar of the Stoogeum in Ambler, Pa., told us the comics appeared in Baltimore eleven times between 1935 – 1960. Given the dates of her employment, Kate most likely encountered Moe Howard, Larry Fine, and Joe DeRita, who appeared at the Hippodrome Theater in 1959, and at Gwynn Oak Amusement Park in 1960. Kate poo-pooed the talk of ghosts at the Lord Baltimore, noting that, as a religious woman, she doesn’t believe in such things. But she was amazed at the elegant restoration of the hotel and said she was looking forward to taking the grand tour. ← Will criminal charges be filed in Las Vegas massacre?